Well, we knew the payroll was going to go down. And now that the opening day roster is set, we know just how far the payroll has fallen. Last year, the Rays opened the season with a $71.9 million payroll. This year, with several high-priced defections, the opening day payroll will be $41.9 million. That is a drop of 41.7% from a year ago. Of course, that is close to the $43.8 million opening day payroll in 2008, the year the Rays went to the World Series. Shaded players are not projected to be on 25-man roster. (1) Leslie Anderson is not on the 40-man roster, but has a contract that guarantees him $450K. That figure is not included in the total payroll. (2) Once a player is added to the 40-man roster, the team can ‘option’ the player to the minors 3 times. A team cannot be charged with using more than one option in a given season even if a player is demoted to the minors several times that year. An option is not used if a player is added to the 40-man roster midseason unless he is sent back to the minors at some point. An option is only used if a player spends more than 20 days in the minors while on the 40-man roster. A player with more than 5 years experience can refuse a minor league assignment, so we list those players as having no options. (3) Years remaining under control of franchise before free agency eligibility. A player can become a free agent after 6 years of Major League service time. 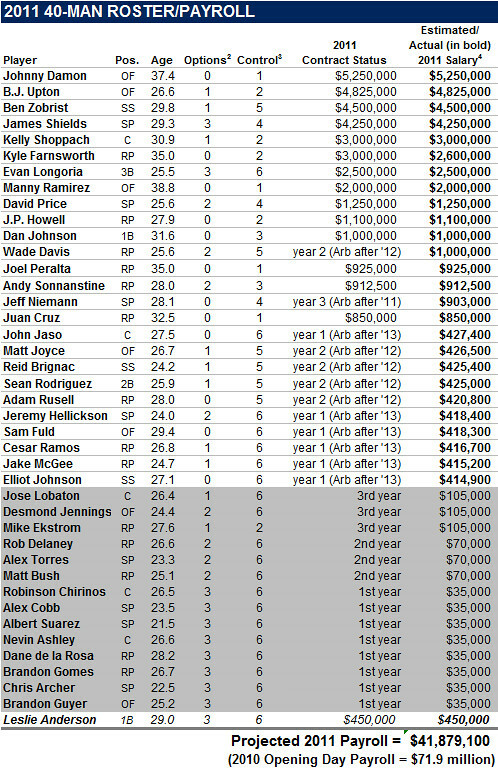 (4) First, second and third year players will have their salaries determined by the team, but will fall close to the major league minimum which is $414K in ’11. Minor leaguers on the 40-man for the first time make $35,000 and second-year players (or players with at least 1 day of major league experience) make twice that amount. We are not including signing bonuses or incentives. I've always wondered: what happens with, say Jeremy Hellickson's salary if he gets optioned to Durham? They are still paying his big league salary, right? And if they call up Alex Cobb, he'll still be making $35k even though he's in the bigs? I'm not sure what would happen to a player who gets sent down, but anyone who gets brought up gets the MLB minimum for the time they are in the big league. Otherwise owners would be too tempted to bring up a bunch of guys earning $35K! I'm sure that's part of what makes a mid-year call-up so exciting for a minor league player - the big paycheck. Those salaries are just what they make if they spend the entire year in either the majors or the minors. For guys that get demoted or promoted it is prorated. So if Hellickson gets demoted his twice-a-month paycheck will be based on ~$70K salary. And vice versa for guys that get promoted. This is why signing bonuses for draft picks are so important. Outside of the bonus they don't make much until they're in the bigs. The exception are guys that sign guaranteed big league deals after being drafted. This happened for Niemann and Price. So those guys had much higher annual salaries even in the minors. And Leslie Anderson, the free agent from Cuba gets $450K this year even though he is in the minors. Good to see Longoria has 3 options left in case we need to send him down to the minors. Note: only 4 players on the 25 man roster are signed only for 2011 ...Manny Johnny, Cruz and Peralta. We have control over Delaney for 6 years? Where is Cory Wade on this list? Delaney has only spent a few days in the big leagues, and he won't hit free agency until he has spent 6 years in the bigs. Cory Wade was signed to a minor league deal, so he is not on the 40-man roster.